Provided photo Miami East-MVCTC FFA Chapter Greenhand Degree Recipients were front row, left to right Ethan Ott, Ian Ellis, and Samuel Sutherly. Second row, Kris Richey, Elias Strubler, Anthony Putnam, Grayson Jacobe, Evan Massie, Cael Rose, and Austin Francis. Third row, Gwyndalynn Ferryman, Katie Larson, Sunnee Hazel, Emma Sutherly, Kaitlyn Roop, Courtney Bair, Abigail Henderson, and Sierra Johnson. Fourth row, Jayden Gates, Chloe Gump, Lexi Stevens, Cadence Ray, Marisa Savini, Gretchen Stevens, Haley Horne, and Summer Sizemore. 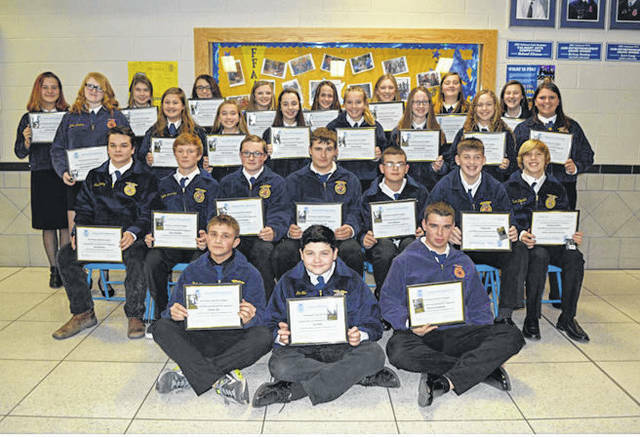 CASSTOWN — On Monday, Nov. 26, the Miami East-MVCTC FFA awarded 29 new members their Greenhand FFA Degree. The Greenhand Degree is awarded to first year members of the FFA, and is the first award that can be received. Each member awarded received a pin to be worn on their FFA jacket and a certificate of achievement. Kalyn Strahley, State FFA Treasurer of the Ohio FFA Association, was the guest speaker. In order to receive the Greenhand FFA Degree the members must be enrolled in an agriculture class, have plans for a Supervised Agricultural Experience Program, learned and explained the FFA Creed, Motto, Salute, Mission Statement, Code of Ethics and uses of the FFA Jacket, Colors, and Emblem, and demonstrated an understanding of the FFA’s history, chapter constitution and by-laws. The Greenhand FFA Degree is the first of four degrees that an FFA member can earn. The students earning the degree were Courtney Bair, Ian Ellis, Gwyndalynn Ferryman, Austin Francis, Jayden Gates, Chloe Gump, Sunnee Hazel, Abigail Henderson, Haley Horne, Grayson Jacobe, Sierra Johnson, Kaylin Joseph, Katie Larson, Evan Massie, Ethan Ott, Skylar Phillips, Rylee Puthoff, Anthony Putnam, Cadence Ray, Kris Richey, Kaitlyn Roop, Cael Rose, Marisa Savini, Summer Sizemore, Gretchen Stevens, Lexi Stevens, Elias Strubler, Emma Sutherly, and Samuel Sutherly. https://www.dailycall.com/wp-content/uploads/sites/30/2018/11/web1_Greenhand-FFA-Degree-Recipients.jpgProvided photo Miami East-MVCTC FFA Chapter Greenhand Degree Recipients were front row, left to right Ethan Ott, Ian Ellis, and Samuel Sutherly. Second row, Kris Richey, Elias Strubler, Anthony Putnam, Grayson Jacobe, Evan Massie, Cael Rose, and Austin Francis. Third row, Gwyndalynn Ferryman, Katie Larson, Sunnee Hazel, Emma Sutherly, Kaitlyn Roop, Courtney Bair, Abigail Henderson, and Sierra Johnson. Fourth row, Jayden Gates, Chloe Gump, Lexi Stevens, Cadence Ray, Marisa Savini, Gretchen Stevens, Haley Horne, and Summer Sizemore.